Space Hulk: Deathwing review code provided by the publisher. As a longtime fan of Warhammer 40,000, I can say with some confidence that there are very few other settings that lend themselves quite so grandly to the tactical FPS genre as well as Space Hulk. With its claustrophobic, dimly lit corridors, relentless Genestealer hordes and often spontaneous requirement for improvised squad-based stratagems, Space Hulk has long been seen as the perfect backdrop for Warhammer 40,000’s most intense encounters and with the release of Space Hulk: Deathwing on PS4, fans will discover an impressively faithful offering that sadly finds itself tragically compromised by poor performance and other technical issues. Let’s start with the good stuff first. If you’ve even a passing interest in Space Hulk and Warhammer 40,000 you’ll be pleased to know that Space Hulk: Deathwing absolutely looks, sounds and feels faithful to the original source material. As a Space Marine of the Deathwing, the legendary 1st Company of the secretive Dark Angels chapter, you’ll find yourself thrust into the titular Space Hulk – a vast and unruly amalgamation of other ships and debris that have drifted in from the Warp, the immaterial dimension of Chaos. Space Hulk: Deathwing review: You can expect to be outnumbered often in Space Hulk: Deathwing. Concealed within its massive spaces however are all manner of precious artifacts and other long-forgotten items that could help the Dark Angels turn the tide against the indomitable forces of Chaos, and so it is the narrow corridors and sprawling compartments of the Space Hulk that all serve as an evocative stage for its tactical FPS underpinnings to unfold. With a story campaign that can be tackled solo or in online co-operative play with up to three additional human bods, players find themselves charging through the Space Hulk, carving/shooting/blowing up enemies with abandon all the while collecting relics and completing mission objectives. A tactical first-person shooter with a difference – what makes combat in Space Hulk: Deathwing especially dangerous is that infinite numbers of enemies literally pour into every room and corridor via spawning entrances that are marked on the tactical map that players have access to. 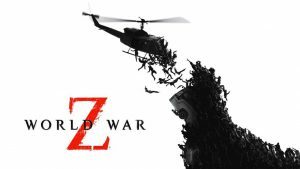 As such, because you’re up against a horde that just keeps on coming, you never feel safe – you can’t just wait until you wipe all the enemies out in any given space, as you would in other shooters, because they simply just won’t stop coming. Because of this, and the need to stay mobile at all times, Deathwing instead demands that players master a variety of flanking and covering tactics in order to stay alive. For example, rushing down the corridor with a never-ending torrent of flesh-tearing Genestealers in tow is never an ideal situation to be in – however, you can mitigate the danger by having one character taking point clearing out the corridor ahead, while another stands at the back of the group, walking backwards in order to effectively cover the space left behind. Space Hulk: Deathwing review: Flanking tactics and setting up choke points at key locations are intrinsic to your survival. 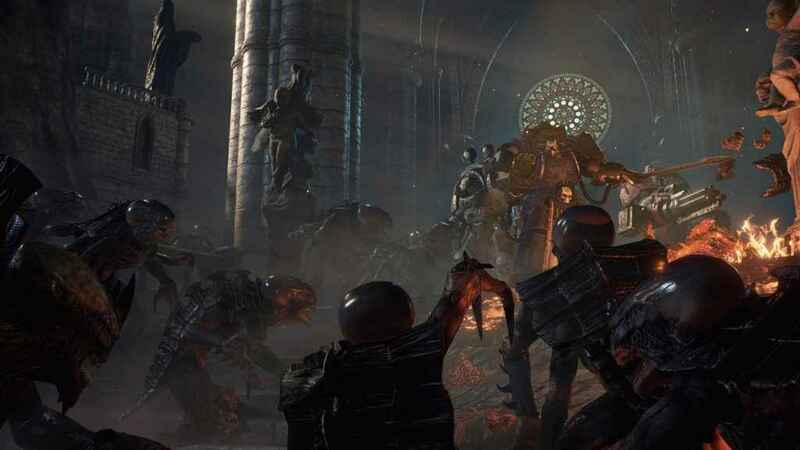 Ultimately, it’s these sorts of encounters and the tactics that they require which sets the tone regarding much of how Space Hulk: Deathwing plays out. Sure enough there are variances in enemies, with the numerous weapon-toting Genestealer hybrids, ultra-tough Genestealer hulks and psychic-powered foes being among some of the most dangerous you’ll face but in the end, swift reactionary tactics and strategies will just about always win the day. It’s refreshing to note also that while Deathwing invariably works well as a compelling co-operative multiplayer experience, the AI Space Marines that stand in the stead of their flesh and blood counterparts during solo play are also eminently capable of backing you up and taking the fight to the enemy however you see fit. Handily, each AI controlled member of the group can be given orders via a useful radial menu too, enabling players to inform their AI fellows to defend a spot, follow, attack on sight or heal a friendly unit to name just a few of the commands that can be dished out. Another trick that players have in their aresnal is their ability to conjure a Psygate; a psychic portal that allows a respite from combat to manifest themselves in an alternate dimension where they can change their weaponry, replenish their health and recharge all of their squad abilities. Though a neat thing to have, the problem with the Psygate, or moreover the manner in which it is summoned, is that it is mapped to the touchpad button which makes it is far too easy to trigger by accident and when you invariably do there is no way to cancel it – thus wasting valuable resources in the process. 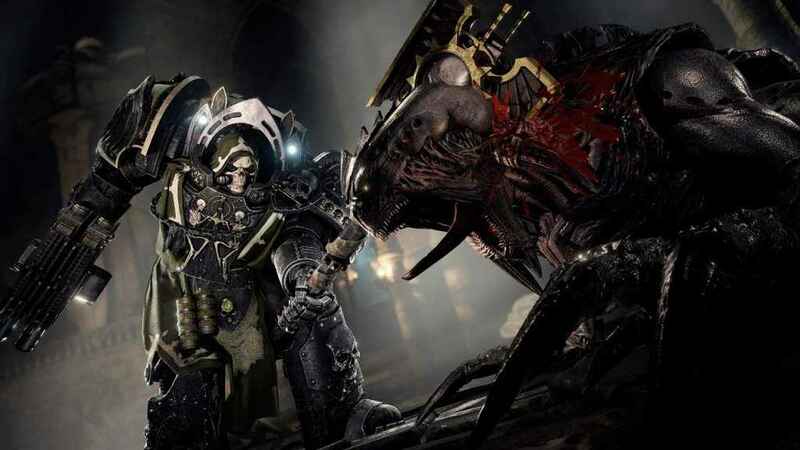 Space Hulk Deathwing review: It’s not all guns and firepower; some of the most devastating attacks in Deathwing come from the various melee weapons that you’ll gain access to. 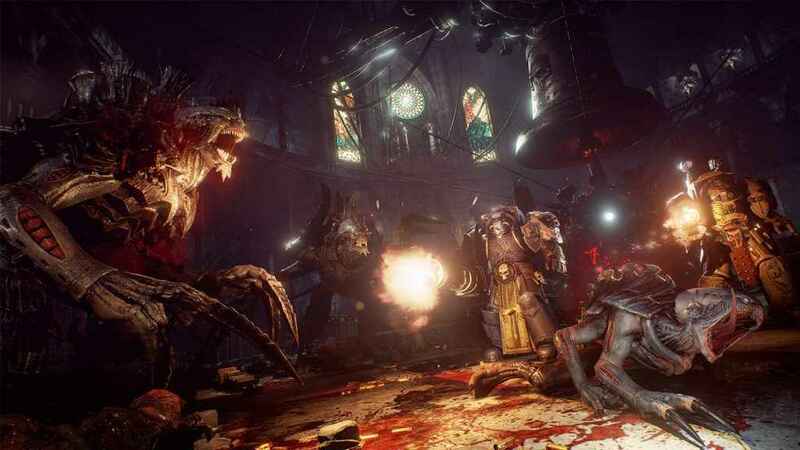 In addition to narrative progression through the campaign, Space Hulk: Deathwing also introduces a number of different classes (including a new ‘Chaplin’ class for this Enhanced Edition of the game) that each have their own abilities and armor types, as well as an upgrade system that allows you to customize everything from buffs to cosmetic flourishes on the equipment that you use. Poiintedly, the valour and experience points that you’ll need to do this are earned primarily through Deathwing’s ‘Special Missions’ – a unique set of sorties that become available whereupon you venture back into the levels you have already beaten to complete brand new objectives. The kicker to this however, is that not only are these missions much more difficult than they otherwise would be, with much stronger enemies than you might typically encounter, but the layout of these levels is altered too, with some previously freely accessible routes now blocked by fallen masonry and other such debris. Where Deathwing mainly succeeds is in how thoroughly it actually makes you feel like a space marine as you clunk and stomp your way through the titular Space Hulk. The guns all feel superb too – with great heft, recoil and some thoroughly satisfying sounds to boot. Whether you're shooting jets of white hot flame down a corridor or tearing through an oncoming horde with the ridiculous firing rate of the assault cannon, simply being a Space Marine feels great in Space Hulk: Deathwing. The quality of the sound effect work also carries through to the ambient atmospherics that the game leverages too, such as the clanking of distant pipes, the running feet of monsters in the floor directly above or the war cry of the Genestealer horde. And now for the bad. Almost completely undoing all the good seen elsewhere, in its current state Space Hulk: Deathwing’s technical performance on PS4 Pro is nowhere near what it should be. From long loading times that stretch upward from 30 to 45 seconds to kick off each mission, to occasional crashing and then finally massively fluctuating framerates often plummet down to single figures when things get busy, it’s clear that Space Hulk: Deathwing needed far more polish than it actually got (bear in mind this game was tested on PS4 Pro hardware, so regular PS4 folks will likely fare worse still). Pointedly, it’s the gargantuan frame rate drops that really hurt the overall experience the most because trying to fight off 10-15 enemies at once while the frame rate is in the toilet proves to be nigh on impossible (let alone enjoyable) as everything slows to a crawl while responsiveness just goes takes a leap off of the nearest cliff. 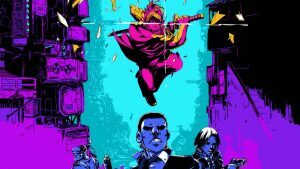 Of course, additional optimization is very often the first port of call for post release patch work so I’m confident and hopeful that it will be addressed in the future. As it is, Space Hulk: Deathwing is an atmospheric and tense tactical FPS that simply cannot overcome its technical shortcomings and that is a real shame. If you enjoyed our Space Hulk: Deathwing review, you might want to take a peek at our constantly updated feature that covers some of the best FPS titles you can get on PS4 right now. 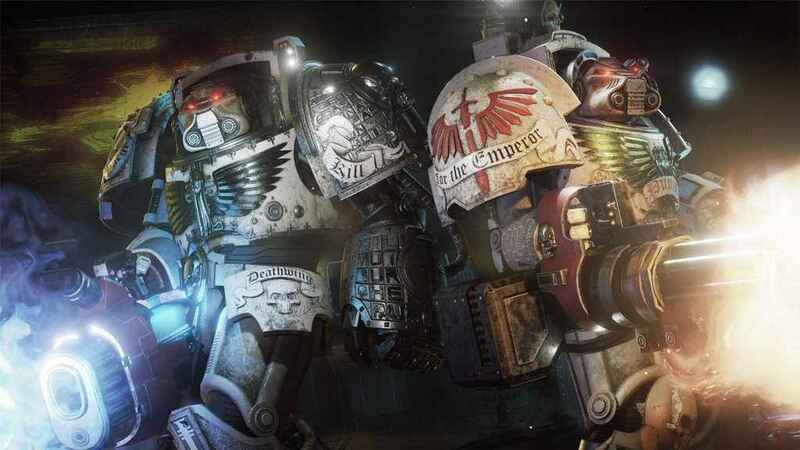 A decent and atmospheric tactical shooter which finds itself marred by a raft of technical issues, Space Hulk: Deathwing isn't the high caliber Warhammer 40K FPS we thought it would be.